Stellar Planet: What makes something a moon? to get a more in depth definition or series of parameters other than the logical definition of a natural satellite. Here is what I found out. A moon is a natural satellite orbiting around a planet that is itself presumably orbiting a star. That is it. Even the IAU (International Astronomical Union) doesn’t have an official definition other than natural satellite. 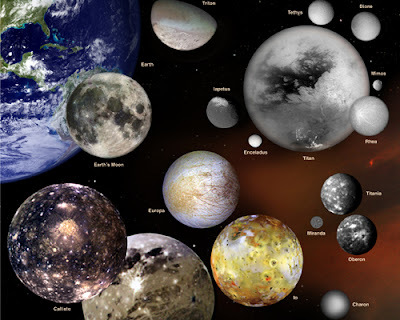 That said they didn’t have one for a planet until 2006, and that on a technicality excludes all exoplanets, so maybe it is best not to ask them to define it just yet, though they do have sole control over the naming of all natural satellites and planets. Unsurprisingly the first moon discovered was our own, though it was originally thought to be a planet; it sets the generic image in our minds for what a moon should look like. A large spherical rocky body smaller than the planet it is orbiting. And while, yes a moon must be smaller than the object it is orbiting, it does not need to be significantly large nor spherical, and though most are primarily rocky, unlike our moon, many others exhibit geological activity and even maintain dynamic atmospheres. One moon of Saturn, Rhea, is even thought to have a moon of its own. In our solar system there is a grand total of 171 natural satellites orbiting the 8 main planetary bodies, and that number has almost doubled since 2003 alone. The four outer solar system planets (Jupiter, Saturn, Uranus, and Neptune) all also have ring systems. These are set apart from moons as they are not a distinct whole object and are instead comprised of dust and ices forming a continuous band around a planetary body. There are also a number of these moons that would perhaps benefit from another classification, such as captured asteroids. 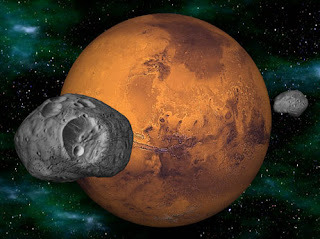 The classic example is the moons of Mars, Phobos and Deimos, which are among the smallest in the solar system and are irregular in shape; Phobos even has a crater nearly half the width of it distorting its shape even more. Jupiter and Saturn also have a number of natural satellites that are more likely captured asteroids, orbiting at highly inclined angles from the equatorial plane and travelling along elliptical paths about the main planetary body. Jupiter has 16 such objects orbiting it, and Saturn has 9. Some of these types of body are also thought to be the remnants of a larger moon that broke up altering the orbits of the debris while not leaving the gravitationally bound system. Perhaps, like with the planetary definition, any definitive distinction between these object and their rounder neighbors will result in a reduction of the number of classified moons in the solar system. However, until then there will continue to be confusion and disagreements between the exact definitions until it can be clearly and concisely defined, most likely by the IAU.